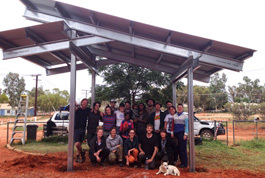 The Bower Studio team designed and constructed innovative outdoor living spaces with two households in the remote township of Titjikala in the Northern Territory. Community consultations in October 2013 and February 2014 at Titjikala identified the need for outdoor living areas in specific households – particularly at houses without verandas and those with large numbers of residents and/or visitors. Some of Titjikala’s housing has been built without verandas which makes them particularly uncomfortable and unsuitable during the hotter months. This particular project took into account the need for appropriate outdoor living spaces and the cultural preference to conduct many daily activities, such as socializing, child minding and cooking, outdoors. Overcrowding can also be a big challenge, so these outdoor living areas also provide additional living and sleeping space. The participating households were identified after much discussion and consultation. Stephanie's house, and later at Marie’s house, were selected for this demonstration project. Stephanie’s family were able to pitch in with the students and provide some ‘sweat equity’ to the construction phase. On the other hand, Marie had less support from the community as her social network was much older so she really appreciated the Bower team’s support. This project was a unique opportunity for the students to further their design and community consultation skills while making a contribution towards much-needed infrastructure for these households. The students went on to prepare designs for similar structures as well as providing valuable insights towards simplifying the construction systems and on-site processes.